After a long walk we reached the entrance of Sassoon Docks. 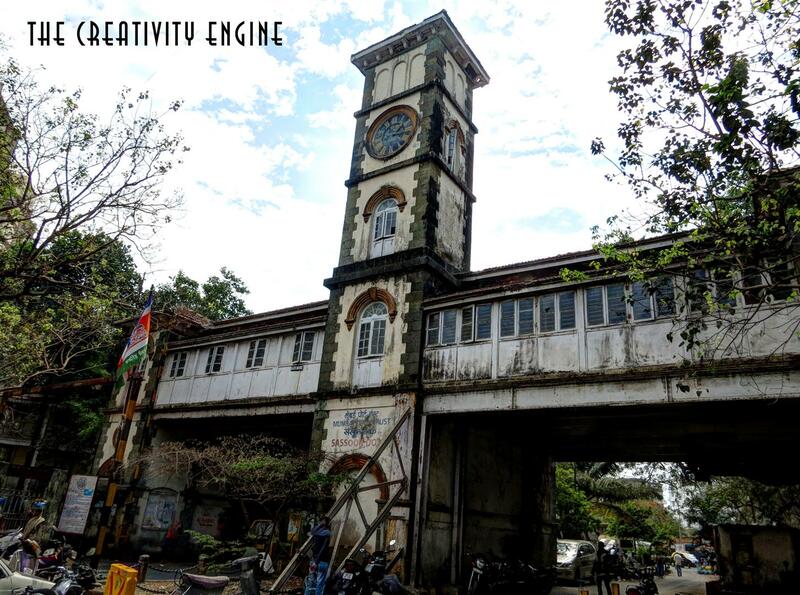 It was an old two arched gateway for entering and leaving Sassoon Docks, time had taken its toll on the gate. It looked like it had not been maintained since a long time. There was a Victorian clock on the center of both the arches. One of my friends checked out a warning board which was kept on the display in the entrance. It told that ‘after some time the entry will be restricted to pass holders’, although the board looked old and rusted. As we were merrily clicking the photographs of whatever angle we could get of the Gate and the clock, a police hawaldar approached us and told us not to click photographs inside the docks. Reluctantly we had to put our cameras away. 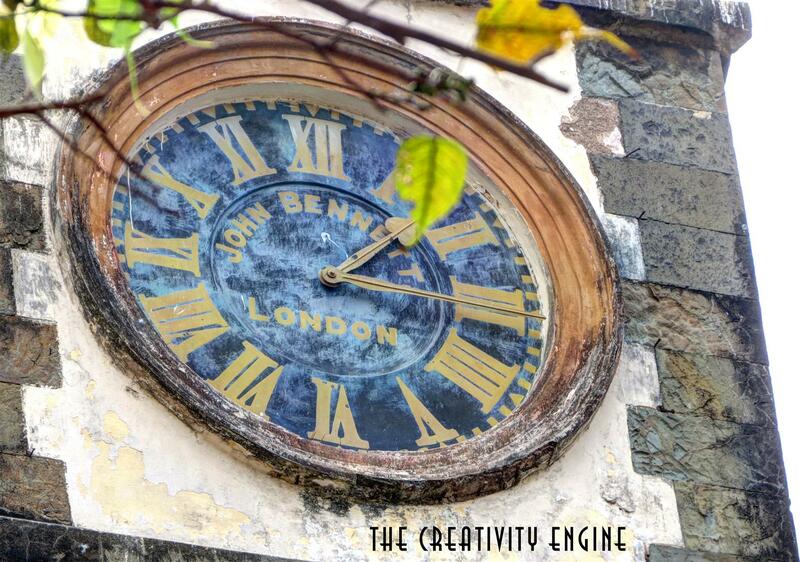 While browsing through the photos spotted this writing on the clock “John Bennett London”. 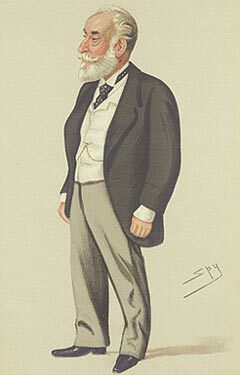 I found out that J. Bennett as well as his company “J. Bennet Watch and Clock Manufacturer” a part of a rich history of London. Do check out this link if you like to know more about him. 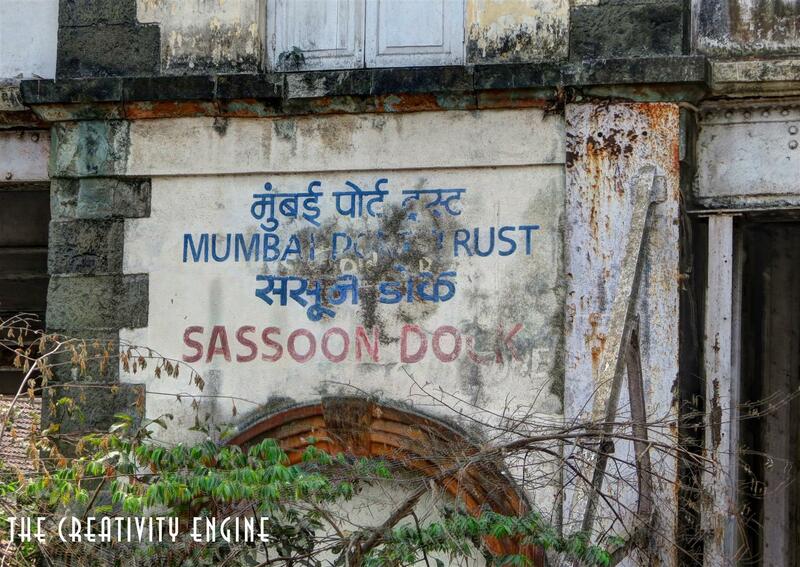 The Sassoon Docks was built in 1875, on a reclaimed land, by Albert (Abdullah) David Sassoon, son of David S. Sassoon, who was a wealthy business person. 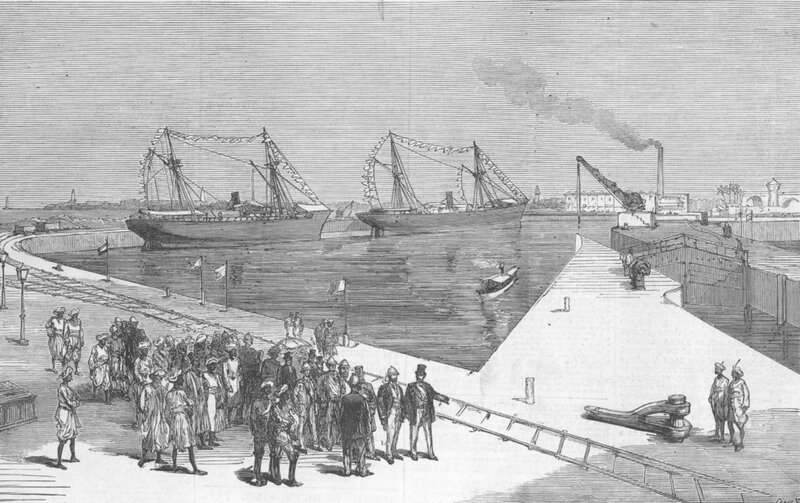 It was the first commercial wet dock in Mumbai which has helped establishing cotton trades. 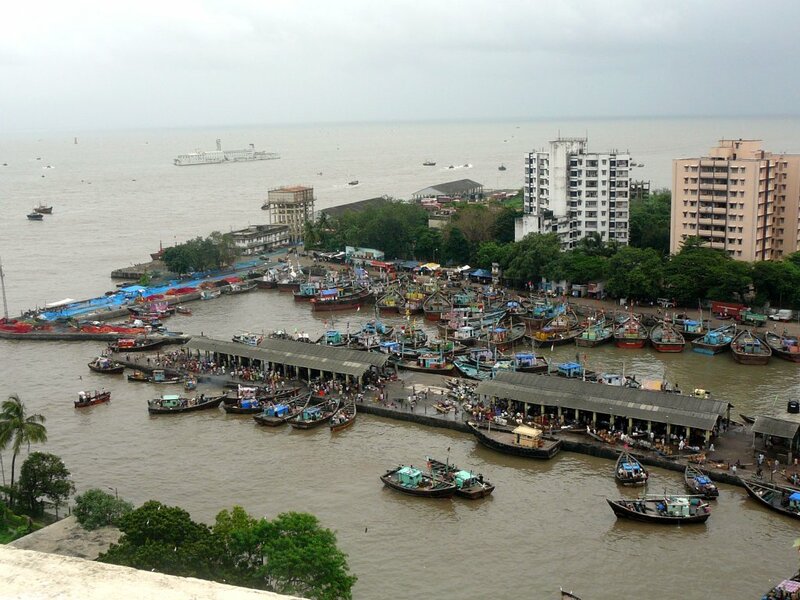 Since its construction it is one of the few docks which is open to the public and one of the largest fish markets in Mumbai. After entering the place, we were warmly welcomed by the smell of a regular fish market. There were huge warehouses which were used for storing the fish. One of the warehouse even had 3-4 vintage cars which we had seen early morning at Churchgate. The concrete roads were ravaged by a bulldozer, so we had to dodge through a small footpath and we managed to get a peek inside one of the warehouses, where the workers were dropping the fish inside a crate (filled with ice) which were then loaded into a van. Exciting the warehousing area, we were busily sidestepping the water puddles and people rushing out of the market with the crate. We saw that the whole shed was dedicated to shrimp and prawns which were “processed” by fisher women folk. The Seagull happily sitting on the feast and thinking ‘Hmm.. whether should I eat this or whether should I eat that‘ as quoted by a friend. We made the journey to the end of the dock with the crushed shrimps below our boots, moaning aloud that the shoes would have to be cleaned before reaching our home. On the left side of the dock lies a dilapidated mill. After inquiring what is it on our smartphones we found out that it was Mukesh Mills. There were trucks with refrigeration units lined up on the right side of the dock. Returning back to the experiences on Sassoon Docks. We also spotted a lighthouse but we were unable to determine its name. A curious friend of mine (acewings.tumblr.com) who has a thing for lighthouses, said lets explore the other side. That right side consisted of a petrol pump for trawlers, two small shops and a shop which sell Garmin G.P.S. systems for navigational purposes. Walking more ahead we saw the a shed used by fisher folk to sleep hang out and bath in the open. From the edge of the shed we could have seen the huge expanse of the blue sea, but the view was obstructed by something. It was a huge white building in the middle of the ocean. That white building was a Naval installation and it was labelled as ‘Oyster Rock‘. We did spot three lighthouses from that same spot which were Prongs Lighthouse (seen from the end of the shed), Sunk Rock Lighthouse (just behind Oyster Rock) and Dolphin Lighthouse. Do check out this blog for photos of this place.